Take a seat and relax while we plan your next golf outing! Let Hiawatha’s friendly family help make your next outing, your BEST outing. Experienced in planning hundreds of events, our tournament professionals can relieve you of the hassles of details and allow you the opportunity to relax and enjoy the day with your customers, vendors, employees, friends or family members. Read through our scorecard of services, then call today to plan your next event at Hiawatha! Tournament Coordination: Our professional planners draw on years of experience to help you draft your event. We can assist with recruiting players, setting up the course to make it even more exciting and coordinating special details to make your golf outing the best ever. Fund Raising: Our event experts employ plenty of fundraising experience on all levels. Suggestions about securing tournament and hole sponsors, creating unique course events and planning a silent auction are just a few of the ways in which we help you reach your fundraising goals. Setup: Our seasoned staff is fully equipped to handle the complete setup of your event. From event registration to the golf course itself, every detail will be properly managed. We’ll do everything from placing all sponsorship signs and banners on the course, longest drive and closest to the pin markers and any other special on-course needs you have planned. Cart Signs: Each player cart will be clearly marked with participants’ names and starting hole or tee time assignment. This organization of carts will make for a smooth start to the event. Practice Green: All participants will have unlimited use of the practice green prior to the event. The ability to warm up should give your guests an opportunity to play better and fully enjoy their day. 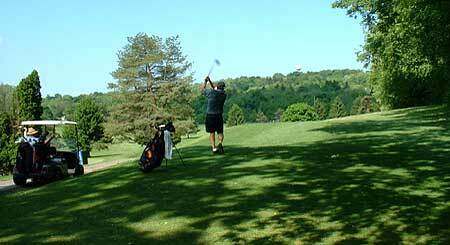 Driving Range: Located just around the corner from Hiawatha at 1150 Vernon View Dr, Mt. Vernon, is a convenient driving range. Ask us for directions. Scoring: Your event can be scored immediately following play by our staff. This activity always creates a lot of excitement and invariably draws a crowd! Meals: Create a menu from our breakfast or sandwich options. Or, if you don’t see what you had in mind … ask us.